When it comes to beach camping, it’s likely that every member of your family will have a different thing that floats their boat. Dad likes challenging 4WDing in the sand? The teenager's into extreme action surfing, boogie/body boarding, wind/kite surfing (the bigger the waves the better)? The little ones' prefer paddling in the calm shallows and building sand castles? Mum (that would be me) more into photographing stunning coastal scenery? Well we’ve discovered the beach holiday location with something to keep every member of the family happy. I know that’s a pretty big claim, but the south-west corner of WA has the goods to back it up. 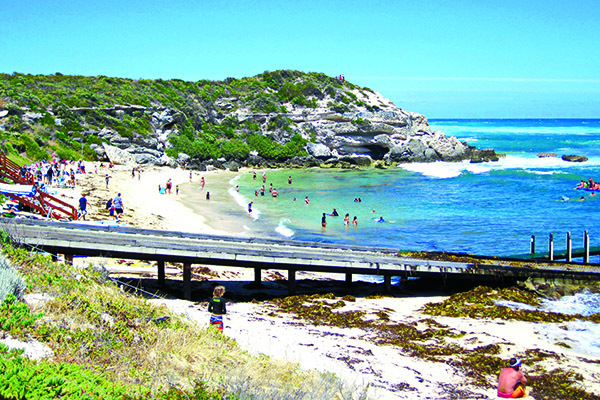 The “Cape to Cape” stretch from Cape Naturaliste in the north to Cape Leeuwin in the south is one of the most popular holiday spots in Western Australia. 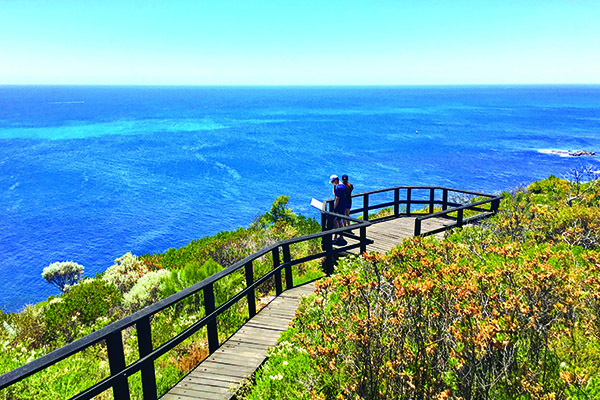 The Leeuwin-Naturaliste National Park runs almost continuously along the coast between the two Capes, overlooking the adjoining Ngari Capes Marine Park and backed up by the towering Karri trees of the Boranup Forest. The nearby towns of Margaret River, Augusta and Dunsborough are renowned for big-wave surfing, premium wineries and gourmet food produce. Are you already getting an idea of why this place has it all? 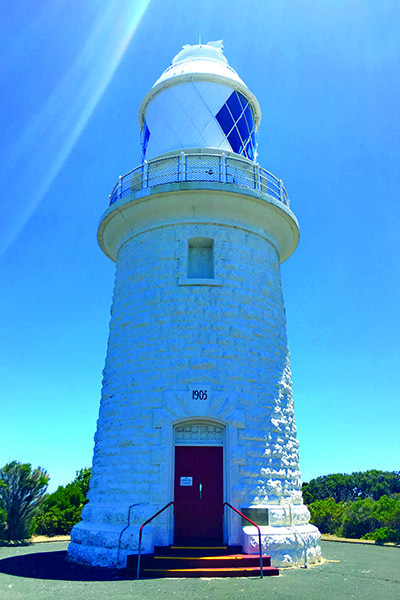 It was about a three hour drive from Perth to our kick-off point at Cape Naturaliste – the northern most point of the Capes — to check out the lighthouse. It was disappointingly short as lighthouses go, being only 20m tall, but the towering coastal cliffs provide all the necessary elevation. It was here that we got our first taste of the area's dramatic coastal scenery. There are numerous walking trails from the lighthouse around the stunning bays and beaches of the Cape, providing amazing views over the ocean and of the local wildflowers. We opted for the walk out to the platform provided for whale watching, and though it wasn’t the right time of year to spot whales, the scenery alone made it well worth the effort. The town of Margaret River provided an interesting collage of hippy, yuppie, tourist and surfer cultures, reflected in both the shops and the clientele. We enjoyed a late lunch at a little shop called Squid Lips. Though the location, tucked in a mall next to Target, was nothing flash it was well and truly compensated for by the best fish and chips we have eaten— anywhere. Accommodation wise, there are numerous caravan park options in the region, and you can even pre-book at the DPaW (Department of Parks and Wildlife) national park campsite at Conto. 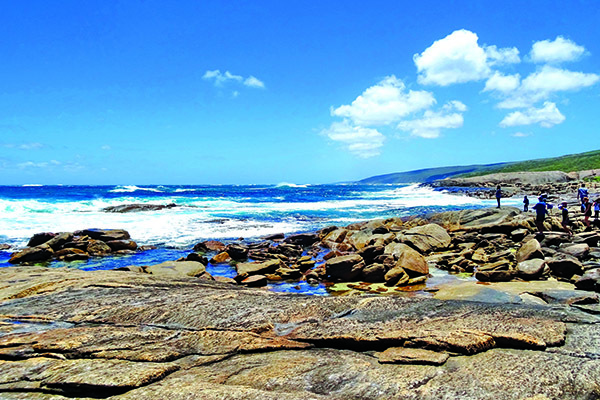 One thing to be wary of when camping on the WA coast is the wind – it is strong. I mean really strong. Like flap your well roped canvas and rock your camper all night long strong. You’ve been warned. With that very thing in mind, we opted for Wharncliffe Mill, a family run bush camp, nestled amidst the tall timber of the Bramley National Park just minutes from the town of Margaret River. Being slightly in from the coast, it’s protected from the strong winds I may have previously mentioned in passing. It’s not a traditional caravan park, but offers all of the typical comforts — hot showers, flushing toilets and a camp kitchen along with shady, well-spaced powered sites. It was great to see their environmental focus – they are very proactive in ensuring, wherever possible, they tread lightly on the natural environment (even little things like minimising external artificial lighting at night so as not to disrupt the local wildlife). And after a few recent encounters with noisy, disrespectful camping neighbours, their strictly enforced “no noise after 9pm policy” was pretty attractive too. It was rather late next morning by the time we headed out towards Prevelly and Gnarabup Beach. To the left of the boat ramp is a cafe and a protected bay with a pontoon moored in the middle (hours of entertainment there for both swimmers and coffee lovers). Just to the right of the ramp is a long stretch of beach more exposed to the swell — something for beginner surfers, stand up paddle boarders and kite surfers. If these waves are a bit tame for you, then head over to the aptly named Surfers Point. You can see why this area is a surfing mecca. At the mouth of the Margaret River, the waves are enormous and the area comes with plenty of warning signs about waves, rips and sharks as well as a guide to correct surfing etiquette and deportment. There are well-built viewing platforms from which you can watch the more adventurous members of the family enjoy themselves in relative comfort. The 'something for everyone' beach theme is demonstrated here is spades. 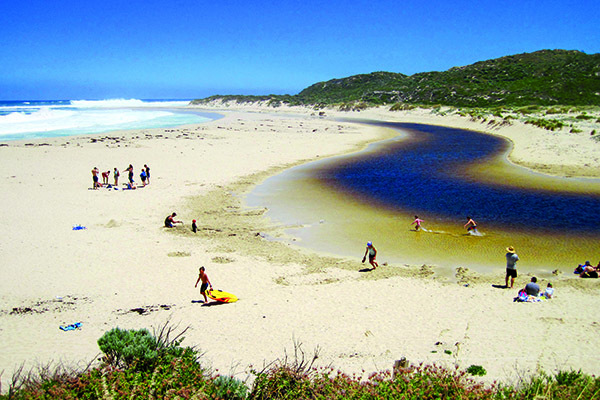 Where the Margaret River enters the ocean, there is a sand bar that protects the river from the waves providing calm, sheltered, shallow (if a little tannin stained) water perfect for the littlies to paddle and make sandcastles. There’s even enough space to get everyone together for a game of beach cricket. Heading back to camp, the kids weren’t going to let us get away without stopping in at the Margaret River Chocolate Factory, and in the interest of keeping our dentist gainfully employed, we also stopped in at Bettenay's Margaret River Nougat Company. At both you can watch the making of the produce live and they have samples available for tasting. The nougat liqueur was a particularly nice find. Next day, again leaving the campers safely back at camp, we made the forty minute drive from Margaret River down through Augusta to the lighthouse which guards the southernmost end of the cape, Leeuwin lighthouse. At almost twice the height of its northerly counterpart, it provides a much more striking figure. This is where the Indian Ocean meets the Southern Ocean and is the most south-westerly point on the mainland. Close by is the Leeuwin Waterwheel. It was built to bring fresh water to the lighthouse from a spring in the nearby marshland. The natural fall from the spring ran along a wooden channel, turning the wheel and activating the ram pump to deliver water to the lighthouse. 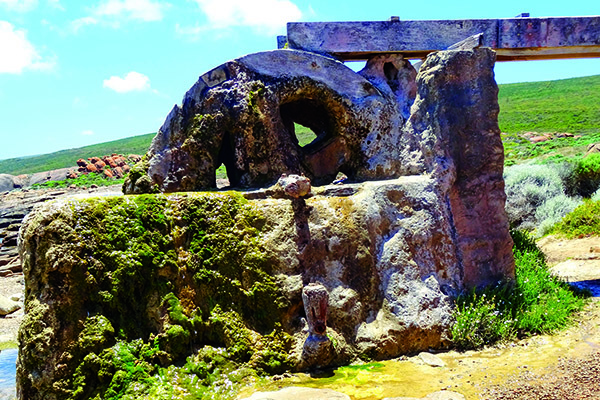 Though the water still runs, the wheel is now so encrusted with limestone deposits it no longer turns and is more a statue. It is a good place to get a closer look at the rugged coastline with more than one person trying some rock fishing nearby (another beach activity ticked off). The return trip to Margaret River was via a much more meandering route than the run down, and gave the boys a chance to engage the low range on the 4WDs. First cab off the rank was Bob’s Track — not for the faint hearted. It was a challenging combination of lumpy rocks, washaways, soft sand, steep soft sand and often narrow clearance. All in all a great track which ticked the 4WDing box and eventually deposited us onto a wild, windswept bay populated only by a few tenacious 4WDers. You can see Hamlin Bay around the coast, but there is no vehicle access to the beach there, so Bob’s Track is the way in and out — great for thinning out the crowds. The next diversion was to take a peek at the Boranup Forest Campground. A beach holiday that includes meandering through the tall trees? Works for me. Tucked in among the towering karris it only has seven sites which are really aimed at tents, but you could possibly get a very small camper in a couple of the spots. Another nice alternative if you prefer a more sheltered camp. It was then out to North Point on Boranup Beach for some more stunning coastal scenery. As the saying goes: Happy wife – Happy life. On the way back to camp we had a stickybeak in at DPaW’s Conto Campground. One hundred and sixteen campsites, lots suitable for tents only, and in summer all rather dusty (guessing the nice green images on the website are taken mid-winter). We continued out on a rather corrugated gravel road to Conto Spring Beach which was a mix of some nice white sandy bays and rugged rocky coast which was being pounded by big swells. The deep booming and soaring spray as water met rock perfectly showcased the immense power of the ocean. 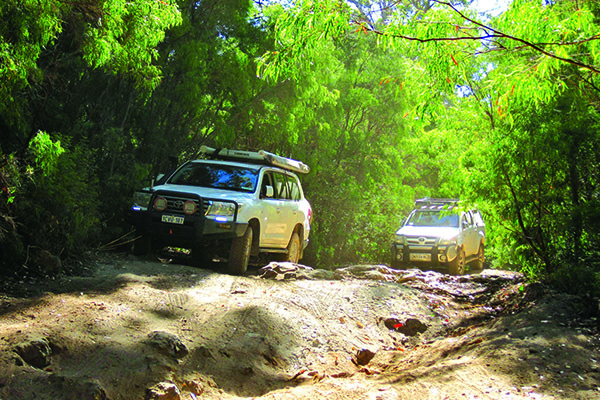 Though the sun was fast sinking towards beer-o’clock, there was one more 4WD track to be tackled before we retired. 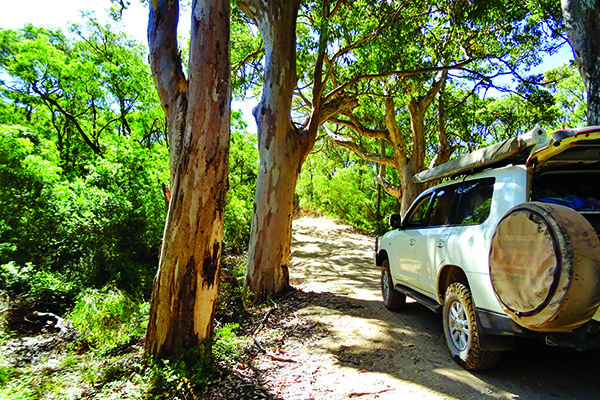 Point Road is the alternative 4WD access to Conto Spring Beach area, and there is a small DPaW campground about half way along. The campsite is open plan and fits about seven tents or 4WD campervans only. You really would struggle to tow anything in here and believe me, we do tend to push the limits of where you can drag a trailer. But it did make a stunning 4WD through the tall trees, nothing too strenuous (apart from the narrowness and tight turns between the trees) and with the setting sun streaming between the tall slender trunks, very picturesque. That evening at camp (unfortunately not around a campfire as there was a total fire ban) the verdict was that we really had managed to tick just about all of the family camping beach-to-do list, with options to keep everyone happy. And as for the bonus of this area – the gourmet food and boutique wine side of things – well, being parked on the beach eating fish and chips straight out of the paper, washed down with an icy beer out of the Engel will do me just fine, thanks. Cheers! Check out the full feature in issue #119 of Camper Trailer Australia magazine. Subscribe today for all the latest camper trailer news, reviews and travel inspiration.